If you ever plan to submit your work for publication or a contest, then you should also plan to submit a cover letter. My journalists friends initially suggested a cover letter only include two quick sentences with the title of the work, word count, and brief summary. I’ve found a letter like that was fine, until I began submitting for longer projects, like book chapters. Sometimes, those editors and publishers want in-depth descriptions, and they usually provide guidelines if that’s the case. That’s what happened when I recently submitted to win a grant for Black women writers. Although I didn’t win, I was one of the Top 10 Finalists. Consequently, two of my manuscripts will be published with their journal as soon as this Friday. I’ll share that publication once it’s published. In the meantime, here’s the cover letter I wrote. I learned the importance of my blackness when I moved from Detroit, Michigan to Jacksonville, Florida. It seemed the Duval County school board hadn’t fully integrated. Consequently, the job fair I’d attended in 1997 held a surprise. On one table, there sat a white paper with the words: Vacancy Black English Teacher. After an awkward conversation about my recent graduation from a teacher education program, the white, male principal offered me a position. That was the first time my blackness preceded my qualifications. I learned the intricate nature of being a woman during my six-year, doctoral program. Single, childless professors rarely took me seriously once they found out I was married with two young daughters. Similar to microagressions based on race, I could never put my finger on one discreet moment. It was more intuitive. More subtle. But somehow proving I could mother, wife, teach, and learn seemed to become an integral part of attaining the prestigious degree. That was the first time my intellect was challenged based on the social construction of gender. I learned what it meant to be a Black woman in academia when I applied for a permanent, tenure-track position at a research university. I submitted my application two separate times. I didn’t receive an interview. The third application was for a one-year, clinical position, teaching only. The institution hired me with a simple Skype conversation. My new colleague was the person they’d hired in the English Education position I’d sought. He was a white man. His terminal degree was not in English Education; mine is. At the time of hire, he had one scholarly publication; I had three. He had five years of K-12 experience; I had ten. He had no years in higher education; I had two. That was the first time race and gender intersected to create a sense of dual oppression. To say that being a Black woman is a double-edged sword is cliché. But it must be said. It’s getting a job because I’m Black and not getting a job because I’m not white and male. It’s reading and teaching about white privilege and male privilege, nodding in agreement with textbook theories, but then having both thrown in your face by the very institutions that preach those concepts. I’ve learned what it means to be a Black woman by attempting to participate in one of America’s most hopeful institutions. By attaining the highest degree possible and asking for a seat at the education table, I’ve learned that racism and sexism still exist, both as independent forms of discrimination and as collaborative acts of subjugation. However, I have chosen to be a Black woman who uses her voice as an act of change. Neither my pen, nor my opinion can be taken from me, no matter my race or gender. Have you ever had to contemplate your race or gender and their impact on your place in society? What’s your experience writing a cover letter? Dr Garland, you are an amazing person 🙂 I have gone through your posts again and this is where I can’t leave without a few words. Your depiction of your history with discrimination stopped me cold. And the comments to your post. To answer your first question, I have never contemplated any race or gender discrimination in my country. Anyway here we love foreigners and women have powerful careers. Well, in my job I usually deal with women, meaning the HR managers or the representatives of the other companies. But as a young teacher I encountered some kind of age discrimination. I was in my mid-twenties and even though I was managing my theater band (my students were writing plays in English and we were staging them for international festivals), I was always overlooked when it came to bonuses or perks. The older teachers were favored. This was one of the reasons I quit the system and started my own business. For your second question, yes, I write cover letters almost daily for me and my clients. I have to confess I find your letter inspirational and I use it in my writings. So, please receive my humble thanks and appreciation for all your achievements and your alive poignant words. Thank you Iulia! I’m glad you had an emotional reaction to this post/letter. Thanks also for sharing your experience with age discrimination. It seems no matter the type of discrimination, it makes us all feel the exact same…inferior. I’m certainly glad that you were able to “break free” and create your own path. You’re so welcome and thanks again for commenting Iulia! I truly appreciate it. Thank you, dear Dr Garland for all your inspiring posts. I always manage to draw a piece of enlightenment (and knowledge) out of your words. Indeed, you are right and like you, I am a fighter. I am sorry for getting back to you so late. I was out of the country for a few days. Wow, this post is beautiful. I can’t imagine what it’s like being a woman and the strength you need to break down patriarchal systems of oppression. I have so much respect for women, you are all amazing. She said it with a tone and conviction that were clearly not hers. Her words rung with a sense of authority and entitlement that is illogically passed on from one generation to the next. I got up and went to fetch one of my friends who was white and never saw her again. It’s a moment that’s stuck with me. For a seven year old to think like that is truly frightening. Actually I preferred her approach because it was direct and honest and much more straightforward then the subtle, silent pieces of racism I’ve faced since. I’ve heard many of these stories from varied black people around the world. What surprises me about yours is that you’re fairly young. I think for a small piece of time and space, some of us really believed that overt racism was over. I’m sad to know that it definitely isn’t and that you had to experience it firsthand. Experiences like these change are what make our worldview so much different. I think I’d agree that overt racism is much better than the implicit and institutionalized kind. The latter always leaves you wondering and questioning, if, in fact what you felt was racist. You my friend are so amazing. I love that you posted this and am extremely proud of you for your many accomplishments. As always a great post and happy that you shared it. I feel that being a woman in the industry that I am in is particularly uncommon. Walking around in a hard hat, safety vest with a tape measure and steal toed boots seems to be shocking for men to see. But, I take deep pride in what I do and work just as hard if not more so to prove that I am worthy of my title. Women have to push themselves even harder to demonstrate we are deserving of our income. It’s common knowledge the majority of women are making less than a man in the same positions. I can only hope one day everyone will be equal no matter race, gender, etc. Thanks Lennon!!! I can’t even imagine how you handle those men each and every day! You would have to absolutely LOVE it. I’m sooo tired of working twice as hard to prove my worth in any field because of gender or race, but you’re right. Many times that’s what we have to do girl. Here’s to us…holding it down, each and every day within this crazy system. Some of this simply overlaps being a woman. I thought when I first entered the workforce some 40 odd years ago that I’d outlast the prejudice facing women. I was determined to prove my worth — to work harder and produce better results. But that wasn’t enough. The issue was not really performance. It was insecurity, connections, anger, and entitlement rolled into one messy ball, and rarely examined by those with the inside track. Race adds another layer of difficulty, a layer heavy with history, ignorance, bias, tradition, family relationships, resentment, a misplaced sense of superiority, and outright hatred. Thankfully, the situation has improved. Not, however, enough in my opinion. I agree Anna. I chose to tease out some of the incidents in order to fulfill the requirements for the grant letter, but I do agree that most oppression is overlapping, which is why it’s sometimes hard to point it out when someone asks for confirmation. I’d only disagree with the last bit. I don’t think the situation has improved much. I think people have gotten a lot savvier at hiding their true thoughts and institutions have gotten way better at enacting institutionalized racism. Gender, yes. Race, not surprisingly, no. Yet in recent years I’ve tried to pay more attention to the realities of race and be open to understanding the issues, both subtle and blatant, that affect so many. There are enough things that truly do limit us to contend with, why must any of us be limited by the thoughts of others? What you say is important. “pay more attention to the realities of race and be open to understanding the issues…” is an important first step. Many times, I remember feeling frustrated simply because others dismiss the possibility. Totally agree about that last sentence/question. I see that dismissiveness, and it frustrates me. I see white people judging the reaction and response of black people by their world view, and not opening their eyes to the realities of a different way of experiencing life. That’s not true only with issues of race, of course. Right on! Congratulations on more publications! There are so many that feel voiceless because of their skin color and gender and it’s disheartening because we all have a worthwhile story to tell. Making your mark is an inspiring and necessary venture, so thank you. So true Kelley! I’ve learned over the years that it really is okay to be Black and female in every situation. That’s what will enrich the work space, no matter where I am. And thanks about the publication! I’m excited to share it soon. I hear what you are saying Joan, but I do get an immense sense of pride and pleasure when I find out that someone I thought was anything other than Black is ACTUALLY Black. For example: there was a woman who has become the first black woman to be Head of the National Union of Students here in the UK, and because I thought it was a non-Black person, I nearly didn’t listen to the radio programme – imagine my surprise when I heard her talking to the presenter – sheer joy!! First: Congratulations, Kathy, on being a top finalist for the grant! I know it’s not the same as having received it but maybe the publication credits will bump you up for next year!? It’s been hard to NOT contemplate my race, gender—and now, my age!—and how these impact my place in society. Recognizing all the ways these parts of my identity can be a mountain of negatives, I have to remind myself of what I love about being a woman, being black, and being over 50. 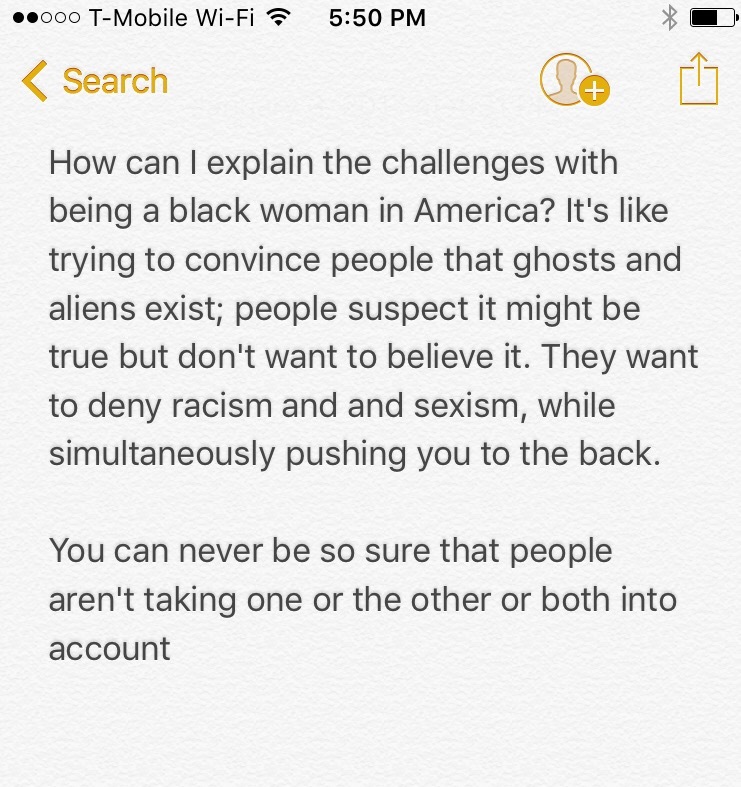 For some reason, though, your questions reminded me of my first experiences writing cover letters for jobs (back when there was no internet/social media to look people up on ahead of time)….and I remember walking into interviews and being hit with that invisible awareness that the person they were expecting was neither black nor female! Thank you Leslie! It’s not, but I was just as excited for the reasons you’ve stated. I guess that’s part of my point too. Because of the way things are set up, you don’t always want to be thinking about it, but once I realized the system of things, I found myself (frequently) second-guessing reasons why. I like that you’ve found a way to stay grounded. Ugh! My hubby had an experience like that. He was literally THE ONLY PERSON sitting in the lobby and they called his name as if it couldn’t possibly be him lol (funny, but not). Even now as I formulate my comment I feel a need to be careful as my position as a black women in my school Can be eliminated. Being careful of my criticism of the need for more teachers of color. I’ve addressed it, but not sure if I was UNDERSTOOD! Yet, I am aware of how my race and gender affect my students who are mostly black and surrounded by mostly white teachers. LOL!!! Funny. I hate to use the word “racist,” but sometimes you call it as you see it!! I wish I could’ve ‘used my voice as an act of change’ then as you are doing so admirably now. You are a real inspiration to women and long may your voice be heard! I’m sorry you even had to experience that level of racism Marie, especially as a child. Even though racism is quite institutionalized now, and not always as blatant, the bewilderment you’ve described is still how it feels to me sometimes. Thank you Kathy. It’s funny, I was thinking a little more about the comment I made and it occurred to me, would I even have the courage if it were to happen today (as an adult) to speak up for myself. Or would I still cower and remain silent. I’d like to think that as an older person I would challenge that white bus conductor and those two white women, but I have a feeling that perhaps, owing to how they might retaliate, I would probably keep quiet and fume about it silently. Noooo would you maybe write a letter if it happened today? I find that while I might not always say something out loud, in the moment, I feel better writing a letter to the company and letting them know what happened. Kathy, that’s a good idea if the situation calls for it. Perhaps not always possible to deal with in the same sort of way if two random people accost you on the street! Better if you have back-up, although they probably wouldn’t have dared approach me if I’d been with other people – such cowards! Racism and sexism are alive and thriving unfortunately. Recent Fox News stories and world news stories tell that we have a way to go till equality and recognition of merit are reached. That’s fabulous! And congrats on the publications – can’t wait to read them! Brava! As I live my own, I honor your choice ‘to be a Black woman who uses her voice as an act of change. Neither my pen, nor my opinion can be taken from me, no matter my race or gender.’ Go on and keep shining because that’s what you do. Yep, when I worked in the financial industry and I was sometimes the only black woman in a room full of black men. Thanks Rosaliene! I was excited about it, even though I didn’t win…I was still pleased. about your glass ceiling comment. That’s true for sure in many instances. And yes, success within an oppressive system really is vindication. “Have you ever had to contemplate your race or gender and their impact on your place in society?” All the time, especially now that I am writing a book that takes place in the 1960’s and is about the back then-unlikely friendship between an African American teenage boy and a white teenage girl. I want to do it justice! Thank you for sharing your poignant story! Wish me luck! Thanks for reading and commenting Carolyn! Your book sounds like another I just read about a little white girl and a black woman who became friends and helped one another; it’s called Whistling Past the Graveyard. I’ll have to be sure and visit your blog to stay posted about your release 😉 AND GOOD LUCK! Thank you so much for sharing, Kathy. You are an inspiration. What you share reminds me of something my spiritual teacher, John-Roger said to me once. I was talking about how people treated me (in this case, my parents), and he said, “Are you going to allow that to stop you from having a happy and healthy life?” It really moved me. In that moment, I made a decision to really be me. To REALLY be me. I love that you asked. And that you’re here. Thanks Kathy.